Kelli Connell. "Betsy, Lake Ediza." Photo courtesy of artist. With the spring semester winding down and summer approaching, Columbia faculty and staff share a sneak peek of the exciting projects they’re working on over the summer months. The artists, scholars, and practitioners that lead our classrooms throughout the academic year use this time and space to continue their creative endeavors, write books on photography and the artists of our time, showcase work that challenges the status quo, compile research on new mathematical theories, design games that help detect eye diseases in children, prepare for the year ahead, and more. Following is a snapshot of some of the ways Columbia faculty and staff continue doing what they love after Commencement. This summer, Photography Associate Professor Kelli Connell will spend the month of July as an artist-in-residence at PLAYA for her project Pictures for Charis. PLAYA is an artist-in-residence program in Summer Lake, Oregon that supports independent individuals by giving them the time and space to focus on their creative work and personal process. Connell’s project, Pictures for Charis, is loosely based on the relationship of Edward Weston and Charis Wilson and the time they spent together from 1934-1945. From March 1937 to April 1938, Weston and Wilson went on 17 trips covering over 16,000 miles in 197 days. Weston made photographs while Wilson kept a travelogue outlining the details of their journeys. Their combined efforts resulted in the publication of California and the West in 1940, which housed 96 of Weston’s photographs and 122 pages of text written by Wilson. With her partner Betsy Odom, Connell has used California and the West as a guide as they traveled to several of the places where Weston and Wilson made work together, as well as places they lived, tracing their relationship from its start to separation. 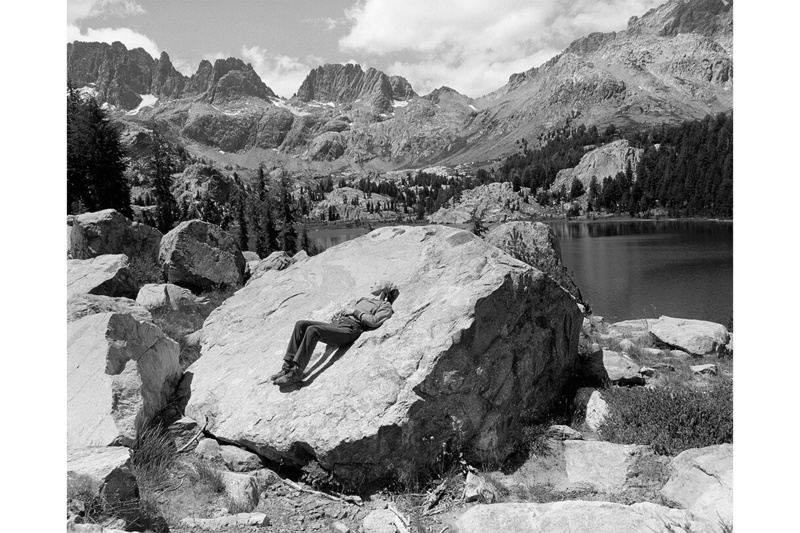 During these travels Connell made photographs of the landscape as well as portraits of Odom. Over the past few years, she has also written accompanying text that will serve not only as an homage to Weston and Wilson but as a backdrop to raise new dialogues about relationships of photographers and models in the 21st century. While at PLAYA, Connell plans to complete a book prototype which will integrate the photographs and text. Alex Damarjian, Interactive Arts and Media assistant professor, was recently awarded a grant to continue work on the PDI Check vision screening game for Nintendo 3DS, which helps diagnose children for various eye diseases. Damarjian, who runs his own game studio, Damarjian Interactive, collaborated with an ophthalmologist, optometrist, and an additional programmer to develop PDI Check. Some children are averse to wearing the standard visual tools used in comprehensive eye exams to measure visual functions, so the PDI Check game is an alternative that is accessible and can achieve the testing needed to detect for eye diseases. PDI Check has been gaining worldwide recognition for its accessibility and cost effectiveness and is played by children all over the world. During the summer, Damarjian will continue to work with his team on the next phase of PDI Check, which includes refinement, checking diagnostics, and creating a treatment tool. One of Damarjian’s other games, Leo vs. Robots, uses artificial intelligence to read users’ responses and adjust words to a more difficult level, ultimately helping to improve literacy. Using a similar gaming technology concept as Leo vs. Robots, Damarjian will create a tool to help treat eye diseases. Damarjian’s favorite thing about being a designer is its potential to change lives: “I love making games that help people. This one detects early onset eye diseases in kids,” he says. In late 2011, Dana Connell, Fashion Studies associate professor, underwent treatment for breast cancer at Rush University Medical Center. Throughout her six months of chemotherapy infusion, Connell observed that the uniforms oncology nurses wore during treatment required single-use personal protective equipment (PPE). Connell became increasingly aware of the uniforms’ lack of functionality, comfort, and design. The associate professor recalled that her nurse was “perspiring so badly she [was] miserable,” which led to conversations with several nurses. As a patient and fashion merchandiser, Connell aims to answer larger questions about protective uniforms for healthcare providers, exposure to toxic chemicals, and whether there is a way to improve the PPE uniforms. Over the summer, Connell will work on building a survey that will be distributed during her Fall 2018 sabbatical. This process will involve networking and interviews with both nursing communities and medical uniform providers. During her sabbatical, Connell will administer the survey with the end goal of obtaining data from oncology nurses in the Chicago area. “I believe this is an important step to improving the PPE uniform for a broad range of healthcare providers working with toxic chemicals,” Connell says. 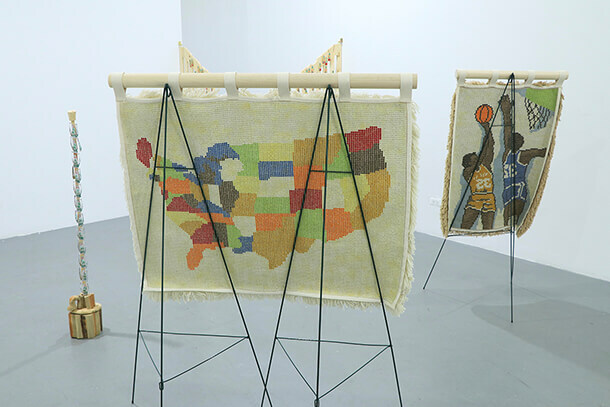 "Documentation of 'Public School' a solo-exhibition of artwork" by Jeffrey Grauel at the Chicago Artists Coalition. Photo courtesy of the artist. The show also features work from Art and Art History faculty member Laura Davis, who has been constructing with old extension cords, vintage designer handbags, and coal. Later, Capitalism is borrowed from one of Davis’ sculptures and is a jab at the term “Late Capitalism.” Grauel, a long-time fan of Davis’ work, is thrilled that their artwork will be featured together: “It should make for a compelling exhibition about the perils of private ownership,” says Grauel. Over the summer, Weihua Li, Science and Mathematics associate professor, will continue her work on the mathematics of compressing space. Since graduate school, Li has researched topological free entropy dimension, one of the most powerful classifications of operator algebras. The associate professor’s current project is a modified version of topological free entropy dimension, and calculates the topological orbit dimension for more C*-algebras. Li plans to visit the University of New Hampshire (UNH) to further work on her summer project. Recently, Li collaborated with Dr. Don Hadwin and Dr. Junhao Shen, both UNH faculty, and proved a result on a new theory on the subject. While at UNH, Li is excited to continue exchanging ideas with Hadwin, Shen, and their research group for about two weeks. 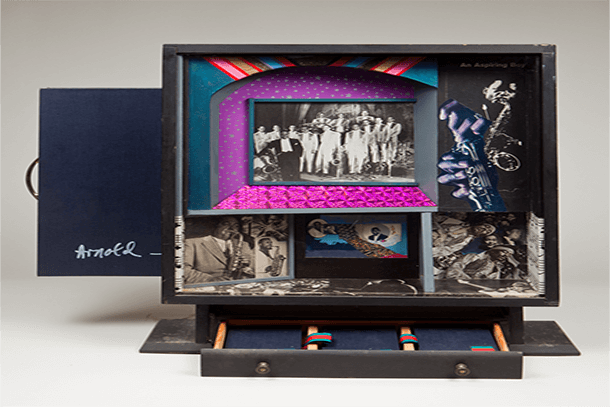 Ralph Arnold, Black Music Box, c. 1980, mixed media collage, Courtesy of the South Side Community Art Center. Gregory Foster-Rice, Photography associate professor, will be finishing work on a scholarly catalogue that will be published in the early fall to coincide with the Museum of Contemporary Photography (MoCP) exhibition The Many Hats of Ralph Arnold: Art, Identity and Politics. The catalogue will be the first book-length scholarly analysis of the prolific Chicago artist Ralph Arnold’s work on photographic collages that appropriated and commented on mass media portrayals of gender, sexuality, race, and politics. The catalogue uses primary sources, archival research, and extensive interviews with colleagues of Arnold, who passed away in 2006. In addition to editing the catalogue, this summer Foster-Rice is authoring the introduction and a chapter about Arnold’s relationship to the burgeoning mass media of the period, linking his art to the rise of advertising, television, and coverage of the Vietnam War. To expand the range of scholarship in the book, Foster-Rice has recruited scholars from various academic disciplines and from across the United States to contribute essays about Arnold’s relationship to the Black Arts Movement, the south side of Chicago, LGBTQ history, and music history. Foster-Rice is also collaborating with Karen Irvine, deputy director of the MoCP, and Sheridan Tucker Anderson, MoCP curatorial fellow for diversity in the arts, both of whom are writing chapters for the book. His research and interests are inspired by other scholars who have recently shone a light on underrepresented but historically important artists of color. The Many Hats of Ralph Arnold: Art, Identity and Politics exhibition will open at the MoCP on October 11, 2018 and will include symposia, lectures, tours, and live musical performances.